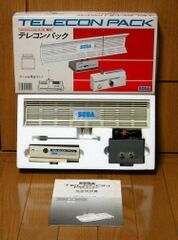 The Telecon Pack (テレコンパック) is a Japan-only peripheral for the Sega Mark III video game console. By connecting the Telecon Pack to the console, players can use the included RF antenna to broadcast signals from the Mark III to a television without having to use wires to connect the two. The broadcast is known for being rather touchy and spotty in modern use with Japanese televisions. RF signals use the same method for transmission in every territory, but they're totally incompatible as the frequencies are different. Just as a Japanese Master System broadcasts on channel ~96 in North America similar problems will be encountered with this unit, so it is not recommended for use with PAL or NTSC-U systems. Similar functionality can be found in the Brazil-only Tectoy Master System Super Compact console.